This quick Mexican appetizer recipe is ideal for those times when you have unexpected guests, or after a long day at work and you want to get home to fix something easy to prepare to go along with a cold drink. At home, we prepare this recipe as an appetizer while we are grilling and waiting for the grill to be ready to cook. Usually, I will use pork cracklings from the Latin grocery stores, those ones that also have a butcher section at the very end of the store. 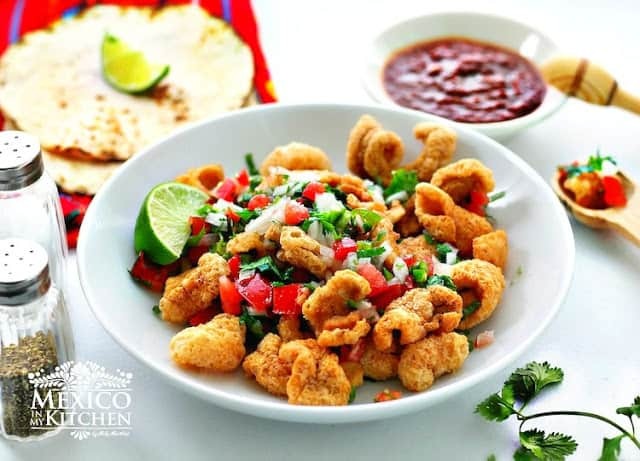 But, not everyone has access to a Latin store, and that is not a problem, you still can make this using store bought pork cracklings the same way I have done this time. Just make sure they are pork cracklings and not those flour look-a-like. Now, add the pork cracklings to the mixture until well combined. Next step, enjoy! This quick Mexican appetizer recipe is ideal for those times when you have unexpected guests, or after a long day at work and you want to get home to fix something easy to prepare to go along with a cold drink. 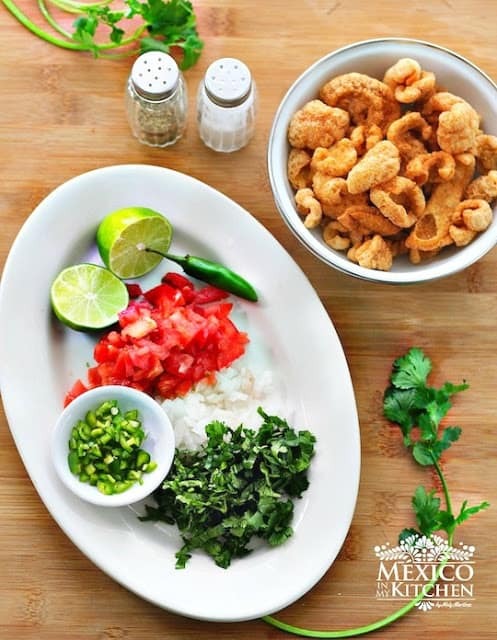 In a medium-size bowl, mix onion, Serrano pepper, cilantro, and tomato. Squeeze the lime juice over it, season with salt and pepper and gently stir the mixture. You can also serve a hot salsa on the side, for those that like to spice things up. I’m one of those, that is why I mention it. A now to the great announcement! The new Absolut drinks website, there you will find a large range of recipes for almost any cocktail you could think of. I was checking them out to see if they have Mexican Cocktails, and yes, to my surprise they do have them. So, if you are looking for a reliable recipe for your next Friday happy hour, you have to check them out! Here are some of the spring inspired drinks featuring on their website. Lots of drinks with fresh and seasonal fruits. One sip on this easy-drinking cocktail will have you thinking of your spring break flings. Tequila and Triple Sec combine with orange and pineapple juices for an irresistible combination. See the recipe for the Spring Fling. over crushed ice for a super refreshing presentation. See recipe for theAbsolute Strawberry and Kiwi cocktail. For a more vegetable spin on spring flavors, head to the herb garden. The classic strawberry and basil duo is brightened with a squeeze of fresh lemon juice and a splash of soda water for a drink even the little ones will enjoy. See the recipe for Virgin Basil and strawberry. I hope you enjoy their new website and that you prepare this quick appetizer recipe with a cocktail of your choice. Scrambled Eggs and beans a perfect match! Previous Post: « Tacos de Alambre: beef, bacon, cheese and…peppers!